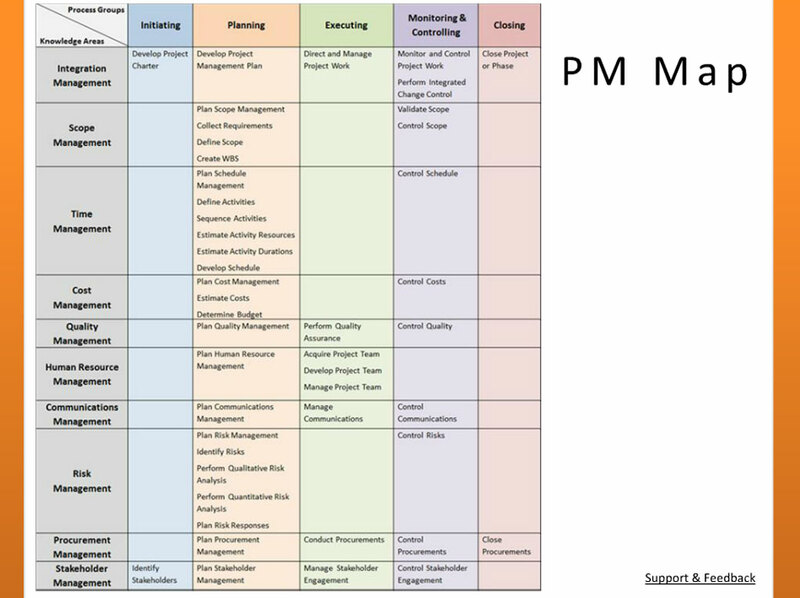 Project Management Processes an in Depth Look at the PMBOK Guide. Module D01 of our 35 hour online PMP training course looks in more depth at the Project Management Institute’s PMBOK Guide and how it uses project management processes and process groups. The aim of the module is to give the student a breakdown of these processes and process groups which will increase their skills in how to define the management of a project. Within the PMBOK Guide are 47 separate processes which could be required during the management of a project. It is broken down into different chapters, each of which represents a different knowledge area of project management. These include integration, scope, time and cost. Each knowledge area defines several processes relating to that specific aspect of project management. These in turn also fit into one of five process groups. These are a collection of processes which share some commonalities, particularly in how they relate to the whole project lifecycle. 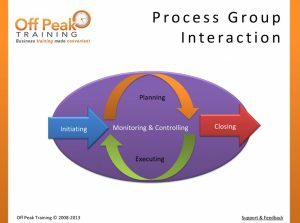 Off Peak Training’s Christopher Talmont, PMP Director of Program Management, goes through the steps required to understand these processes, how they interact with each other and how they connect to other process groups. He explains that processes can have perceived relationships when they share common inputs, outputs or when the output from one process becomes the input of another. The online module also includes a handy guide map to visually demonstrate how the processes interact. There is also an easy to visualize diagram of how the PMP Exam breaks up time spent on each of the process groups which depicts the color groupings used by Off Peak Training so students can easily recognize which process belongs to which group. * Initiating – all projects and project phases begin with this. *Planning – this helps drive project execution. *Executing – this is the phase which leads to refinements and additions and can feed back into Planning. *Monitoring & Controlling – this is the overseeing phase of both Planning and Executing. 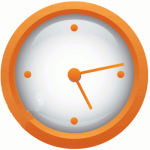 *Closing – as it says, the period in which all tasks and requirements are concluded. The module concludes with an explanation of the differences between phases versus process groups, ensuring that anyone studying for the PMP Exam has the best understanding of the PMBOK and how it operates.